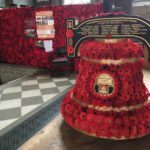 The social gathering ‘In the Ballroom’ at the Court House on Thursday 1st November heard all about the spectacular display of hand-made poppies in St. Mary’s Church, marking the centenary of the WWI Armistice. 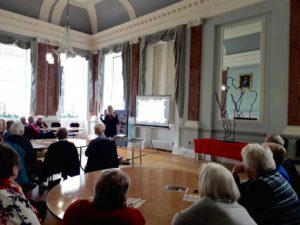 Helen Fitzpatrick explained how a volunteer group had decided at the beginning of the centenary year to appeal for 11,610 poppies – one for every member if the Royal Warwickshire Regiment who had been killed in The Great War. In the end the numbers received far exceeded the target with well over 62 thousand sent from all over the world. Did you know there are several colours of poppy? Red – for each fallen soldier; Pink – for wounded casualties; Purple – for animals that died in the conflict; Blue – representing the cornflower which is the remembrance flower on the continent; White – a symbol of peace. Other speakers in the ballroom gave details of the Christmas Tree Festival which is due to open in the church on November 29th, and spoke of the history and evolution of St. Mary’s itself – from its beginnings in the 12th century, via the Parliamentarians who smashed most of the medieval stained glass during The Civil War, to the Great Fire of 1694 when only the parts of the church with stone-built roofs were saved. 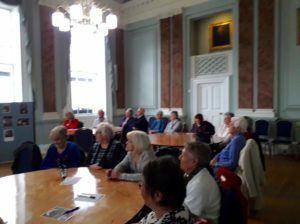 After the talks, there was a poppy-based quiz and the usual tea and fine cake served by Unlocking Warwick volunteers. The bells of St. Mary’s will ring out on November 11th. 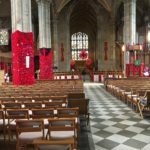 The poppy display in St. Mary’s is open each day between 10am and 4pm until December 9th. 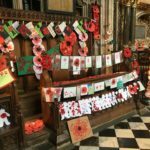 It will be a fitting backdrop to the special Remembrance Service on November 11th and a concert with massed choirs that evening.